That sounds fun, I'll definitely give it a try. 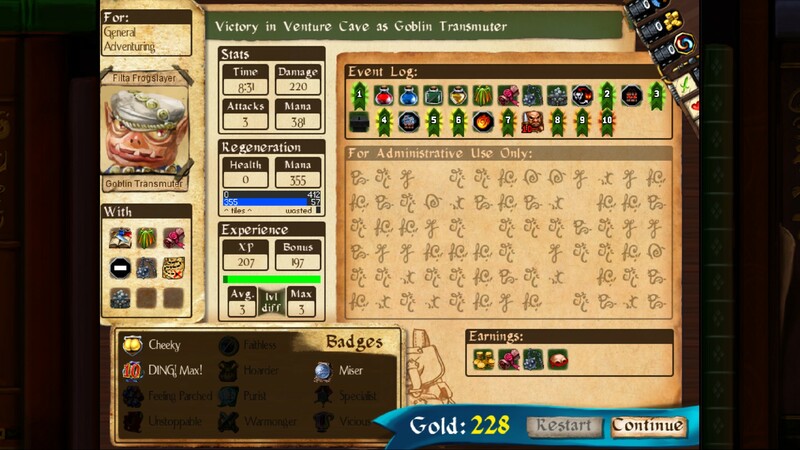 Speaking of goblin transmuters, they are another bunch who can go silly with increased mana. Once I played a sorta 'pacifist' run with them - tried to reach level 10 and win without killing any monsters besides the bosses. Maybe the monsters wouldn't see it as a peaceful thing, but my wording was vague enough in the challenge. Also let's not forget that the KB damage nicely softened my 2nd boss as well. I'm not sure if the Goo's 75% resist seriously decreased it or not, so maybe it can be even greater in other scenarios too. That damage! It's so good. And I have plenty of resources even after this fight. For reference I checked a monster's corrosion, looks like I only took 10 doses of greenblood. So EM was unneeded, the mana I spent under her could have been used under a prepped Mystera for greater effect and earlier boons too. My race wasn't even ideal for this boss and god combo, imagine the destruction a gnome could cause, especially with matching items. Sidenote: if platinum challenges existed, this could be a possible candidate. Your starting item is MW, and you're allowed to take alchemist,blacksmith and mage guild preps. EM and MA are guaranteed to spawn, monsters have the no XP trait (but give 10 piety for petrification). Apart from Bearmace, no preps are necessary, the rest is there to make it look less scary. I love how our player tech has improved over time. A level one bosskill has gone from a theoretical challenge to "eh, here's a first level bosskill, it's okay I guess. Needs improvement." I'm a little unclear on how you cast all those CYDSTEPS. Obviously you had Refreshment and Clearance, but you're talking like Earthmother isn't even needed, and I don't see how what you did could be possible using Refreshment alone. Also, does corrosion trigger on knockback? Wht about on creatures hit by a knocked-back monster? Why isn't EM needed? Her only important boon is greenblood, but it's mana cost is keep rising with each cast. It would be much more mana efficient to just keep casting Cydstepp and hitting the boss with Martyr Wraps. Especially, if you worship MA and it costs a flat 8 mp. You seem to underestimate the power of MA: boosting max mana and taking mystic balance work fantastically together. This time I didn't even restrict myself on potion usage, so mana potions and a single schadenfraude helped me greatly. And my early manapots knocked off some resists too, while as being an orc each glyph converted boosted my damage. Plus MW makes all my hits grow stronger. Yes, corrosion triggers on KB. That's the sole reason I brought the bearmace. It was meant to be a testing run, since I wasn't sure if the Goo's 75% resist will disable that. I mean with 25% KB, reduced to it's 1/4, you'd need 16 basedamage to deal 1 damage and the 2nd portion of corrosion damage, but luckily it doesn't work like that. Even with 5 basedamage it works. Edit: forgot to mention my goal with this strat, I want to achieve that it works on all maps with 100% reliability even with the VT token added. Ha! For some reason, I didn't think about potions. At all. I was thinking "Refreshment gives 8x5=40 mana, which is not enough." But then there are also 4 mana potions and a pair of Schadenfreude potions, which easily tip the balance. Mana burning bosses are going to be painful. You'll probably have to prep quest items and scum for the soul orb. Only if you score both. But Tomithy is a weakling, so it may be even doable then. In other cases you fight the easier boss first, then after leveled up jump at the 2nd guy. Also I mentioned that the gnome is the best race choice, and he would deal with it relatively easily. Sidestepper wrote: I love how our player tech has improved over time. A level one bosskill has gone from a theoretical challenge to "eh, here's a first level bosskill, it's okay I guess. Needs improvement." For example, if you were in a habit of supplementing/performing a boss kill per run with "free" (health independent) hits, not attempting it at lvl 1 was probably due to an extra assumption rather than lack of one. In other words, back in the day, people have probably been going through the necessary motions for the most basic ones, they just never thought it's possible to muster up the damage while ignoring so many elements in a dungeon. Then one day we didn't XD And then the devs made it an achievement and broke that "this can't be right" barrier and now a lvl1 bosskill is a legit thing to consider. 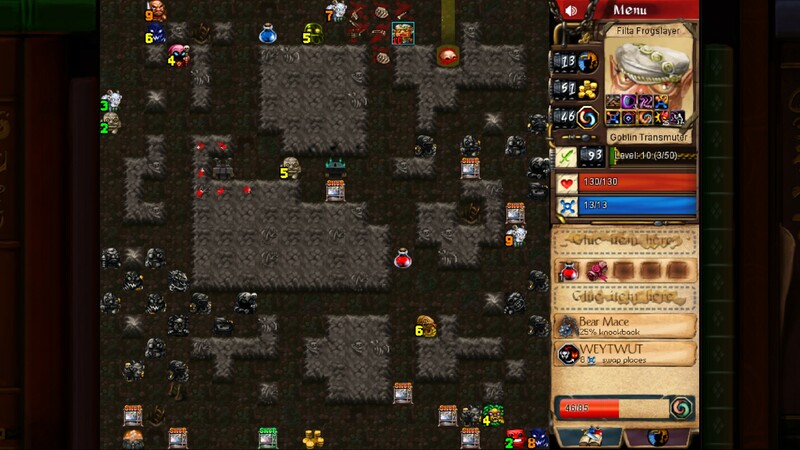 Plus, we've been in a beta for long, and when you do a lvl1 boss kill during playtesting it's always a bit sketchy. Is this legit, or am I abusing something? Being able to kill a boss at lvl1 with something was usually a strong indicator that whatever you were using might warrant a nerf. This is why when I went on a spree of them back in the day I wasn't happy if it involved the old tri-sword, it felt like cheating.